Entry to Lovango Beach House, 20 ft. above sea level, is through a long screened in porch. The airy open spaces are spanned by reclaimed wood pilings from a 19th century railroad trestle that once crossed the Great Salt Lake. There is plenty of room to spread out or relax in the great room: to read a book, to watch a DVD or to just enjoy the incredible views. Screens are the only thing between you and the sound of the surf just below. Virtually every major piece from this custom home comes from recycle materials. 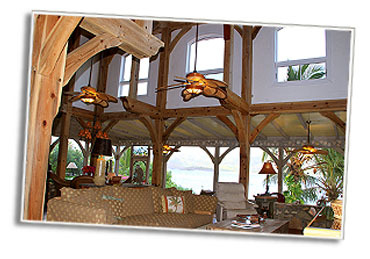 The timber frame is from reclaimed lumber, floor bricks are from old Chicago buildings and stones and shells were found on and around Lovango Cay. A family sized dining table overlooks the water with other dining spots both inside and out, including counter seating around the island gas oven and range area of the fully equipped custom kitchen. The kitchen provides everything you will need for a simple lunch, or intimate dinner to a large gathering. Upstairs is a loft space with a comfortable seating area, a king size bed and a trundle/twin sleeper sofa. A few steps up from the living area is the master bedroom. 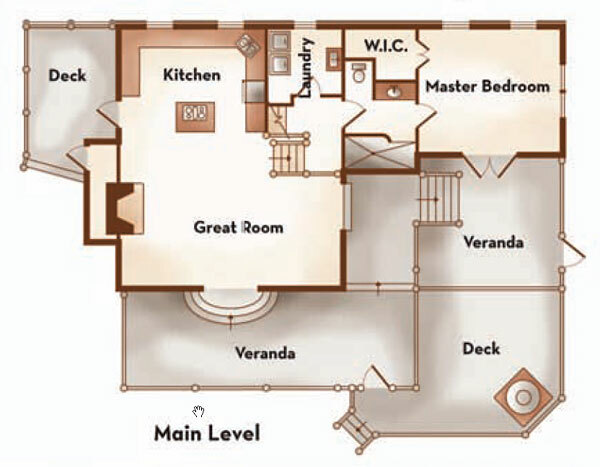 This space includes: a DVD player, a walk-in-closet, and its own screened in porch with a double lounger. Just outside, the recycled plastic and wood fiber deck creates another area for enjoying the sun, and the spectacular ocean views. A few steps down and you are at the waters edge; where one can find even more little nooks and niches for relaxing. With the sounds of the surf and the cooling tropic breezes and that Caribbean moon, Lovango Beach House can be even more magical at night. A Couple, Families, Friends, whoever makes up your group, a very unique experience awaits you at Lovango Beach House! Nestled in the lush tropical gardens is a separate cottage bedroom, this is the original building and is just a few feet from the beach. It includes a queen size bed, a DVD player, its own screened in kitchen, and adjacent cabana style full bath. The cottage front porch chairs are a favorite place for that perfect beachfront read or drink.